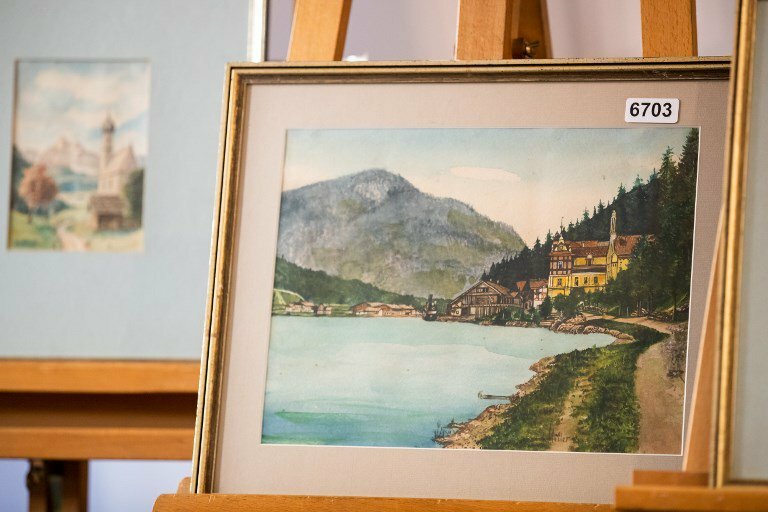 Photo: AFP A watercolour entitled "Ortschaft an Vorgebirgssee", a scene of a village near a mountain lake, signed "A. Hitler", which is on display at the Weidler auction house in the southern city of Nuremberg. High starting prices of between 19,000 and 45,000 euros and lingering suspicions about the authenticity of the artworks were thought to have scared off potential buyers. Nuremberg's mayor Ulrich Maly had earlier condemned the sale as being "in bad taste". The Weidler auction house held the "special sale" in Nuremberg, the city in which Nazi war criminals were tried in 1945. Sales of alleged artworks by Hitler - who for a time tried to make a living as an artist in his native Austria - regularly spark outrage that collectors are willing to pay high prices for art linked to the country's Nazi past. "There's a long tradition of this trade in devotional objects linked to Nazism," said Stephan Klingen of the Central Institute for Art History in Munich. But none of the paintings included any of the totalitarian party's insignias. According to Klingen, Hitler had the style of "a moderately ambitious amateur" but his creations did not stand out from "hundreds of thousands" of comparable works from the period - making their authenticity especially hard to verify. The watercolours, drawings and paintings bearing "Hitler" signatures featured views of Vienna or Nuremberg, female nudes and still life works, the auction house said. They were offered by 23 different owners. Prosecutors on Wednesday collected 63 artworks from the Weidler premises bearing the signature "A.H." or "A. Hitler", including some not slated to go under the hammer. Nuremberg-Fuerth prosecutor's office said it had opened an investigation against persons unknown "on suspicion of falsifying documents and attempted fraud", said chief prosecutor Antje Gabriels-Gorsolke. "If they turn out to be fakes, we will then try to determine who knew what in the chain of ownership," she said. Weidler said in a statement that the paintings' withdrawal from sale did "not automatically mean they are fakes".